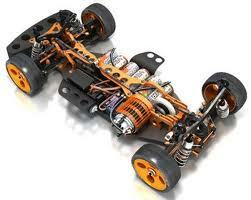 Hobby-grade RC vehicles usually come as kits intended for assembly or RTR, Ready to Run. 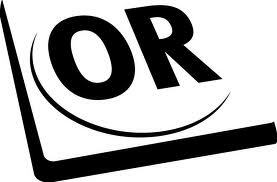 Which is best for you, like most aspects of R/C, depends on what you want out of the R/C experience. Let's take a look at the differences between the two. The Ready to Run R/C vehicles are obviously the quickest way to get up and running. In fact, some of the newer models are only available as RTR's. (Almost) ready to run, right out of the box. You get fast satisfaction. You don't need to worry about purchasing a ton of support equipment. Nitro RTRs at most require AA's for the transmitter & receiver (and perhaps the glow plug igniter), and fuel. Some manufacturers, such as Duratrax, even give you AA's. Electrics often require a battery & charger, but some even come with those. Fewer tools are required to get up and running. In most cases, you only need to charge battery packs, fire it up, and go. Unless you're unusually thorough and tear your vehicle down before you ever run it, you don't get a chance to learn its construction and what to look for or what to expect when something goes wrong. On occasion, there can be factory assembly errors that lead to premature breakages or a lost screw or part. There aren't many let-downs as miserable as when the first full-speed drive of your exciting new RC comes to an end after just two minutes because a drive shaft falls out and you can't even find it again! Greater care has to be taken to fully read and understand the manual with an RTR. Since you didn't build it yourself, you will have a bad understanding of how the various mechanisms of your new R/C work. To add any performance upgrades or hop-ups, you must first learn how to properly disassemble your R/C, a process you would already be familiar with had you built a kit. The lexan bodies of most RTR's are painted from a template before being moulded to fit the model. The only way to custom paint your R/C body is to buy a new one. 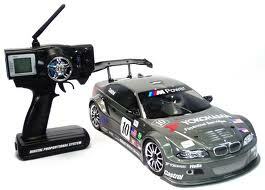 Radio controlled vehicles are an extension a much earlier hobby, scale modelling. If you build your R/C from a kit, not only will you have a greater understanding of how they work, you will have the satisfaction of knowing you built it yourself. You put your hands on see every single part. You, yourself, are the one to lube the differential, set the gear mesh, align the wheels, and tighten every screw. Even if you don't remember the assembly steps afterwards, the building process helps give you the confidence to disassemble the vehicle in the future to do thorough maintenance, make adjustments, or fix a warn or broken part. You get a chance to assemble the vehicle to better than factory specs. You may choose a different mounting hole for a component, or buy and install an upgrade to a part that you know will fail. There's a great feeling of accomplishment and emotional attachment that comes with turning a table full of small parts into a complete, working marvel of engineering. Kits generally don't come with electronics, such as radio equipment, motors, engines, speed controls, or servos. When you build your own kit, you can select the most appropriate brand and quality of these components to suit your individual driving needs and budget. If you are planning on adding performance upgrades, you can purchase these prior to assembly and use them into the assembly process, rather than having to dismantle the vehicle later. Assembling a kit involves building many smaller sub-assemblies, such as transmissions, differentials, and front/rear drive train assemblies, many of which will be internal and hidden from view in the finished model. When something breaks down or fails to function properly, you will have a better understanding of how these parts function and what is going to be involved in repairing or adjusting your R/C. Most kits come with a clear lexan body intended for custom painting. As you build the shocks, you may decide to use different weights of oils and springs. Building takes time. Car & truck kits generally take 4 hours or more. Some advanced-level planes can take weeks of evening & weekend work. If you have particularly unsteady hands or low confidence in your mechanical skills, it may be best to start with something pre built. Kits are not truly complete. They always require that you add your own radio system, but that's if you're lucky. A nitro-powered on road car kit, for example, may require that you also separately purchase your own engine, tires, body, paint, glow plug, igniter & charger and possibly more. A small collection of tools that include screwdrivers, small nut drivers or wrenches, pliers, several sizes of hex wrenches, and a soldering iron and solder are usually required to successfully build an R/C kit.